Thankfully the horse show ended better than it began! Willow (the 7-year old I mentioned in a previous post) recovered nicely. 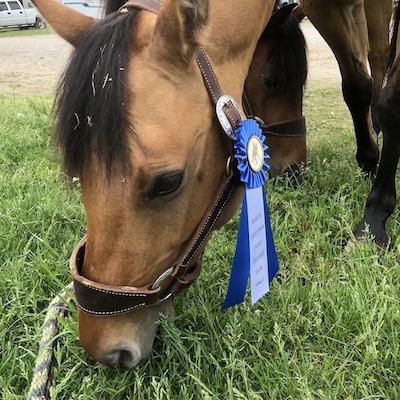 Willow is not a naturally confident horse and this was her first horse show. To give an example of how nervous she was, the first night I was riding in the dressage arena we would be showing in the next day. I had on a light jacket and decided to take it off. I side-passed to the rail and dropped my jacket on the ground (while still mounted on Willow). She was fine with that…but as soon as we rode off and circled back around she decided the jacket was a monster. I spent the next 30 minutes riding past my own jacket while Willow had varying reactions; sometimes a little sideways scuttle, sometimes tension and loss of rhythm, always some tension. I want to say I wasn’t frustrated but I was. 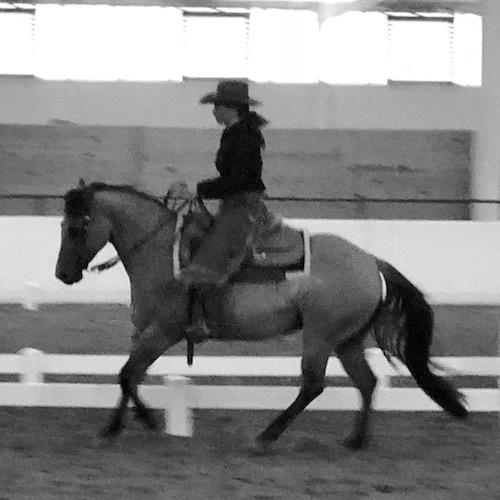 I had worked a full day of teaching a clinic before driving to the show. I was tired and it was late. I knew I was also going to have an early morning. I did feel some frustration but I can say that it was just a tiny hint and I could easily control it. I have openly said that Willow is a more insecure horse and will require quite a bit of travel before she becomes comfortable away from home. I know this because it has taken quite awhile for her to become comfortable at home. 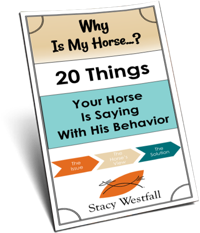 Self-control on a riders part is not the lack of feeling frustrated or other negative emotions…it is the ability to control one’s self when they come up. The next day I rode Willow around outside before the class and again, she was insecure. I was more well rested and the whole point of this show was to help her learn that travel was ok. Again, I rode like I do at home and put her away while I changed my clothes. I’m happy to say that when we went in the ring Willow was finally almost the way she is at home. Almost. She had plenty of pep in her step but she was also confident in our partnership. My reward for self-control was that Willow felt confident in me. 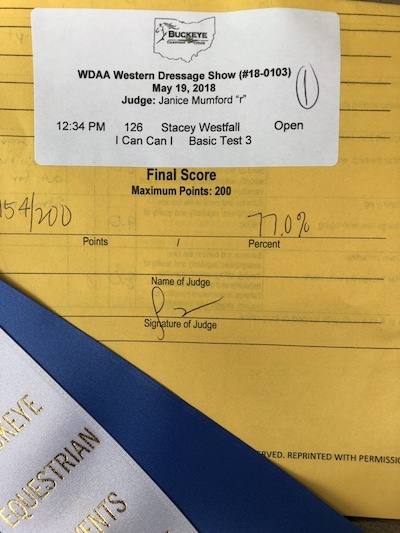 We marked a 77% in her first ever western dressage test! To top it off, at the end of the day, our score was very nearly the high score of the day with only one horse marking higher than us all day, all classes. Willow also received a very unique comment on her scorecard where the judge wrote, “Love this pony! Great job.” Yep, my little power pony Willow…I love her too! ← Do horses remember each other? How will they react? This was such a great reminder to be conscience of our emotions. 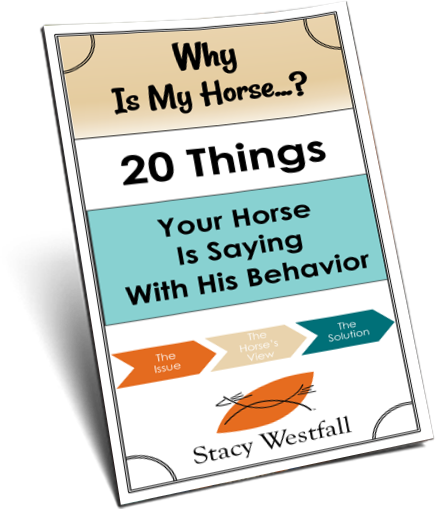 How we reactive also shows up in how the horses react for sure. Point from yesterday, just riding my 8 yr old gelding across the field, wanting a quiet walk in straight line on a loose rein; of course, he wanted to head back to his buddies at the barn so kept breaking into a jog with is head turned. Frustrated to say the least. If I showed my frustration he just became more reactive & would not relax. I did catch myself so continued on, asking him to move into a long trot to get his focus. It helped. He relaxed and even though the straight line was not perfect when finished, he was better . Thanks for such great words of wisdom & sharing your training.! Your examples give such insight on handling situations! Mastering my frustrations and emotions is the next step for me, great article as always Stacy! How well do horses see, under different lighting conditions, a view triggered by memory in brain. Reactive side to Passive side. Is the reactive side in the now or from memory. I have a 13y Sobiano Mare and mountain boulder rocks freak her out especially the greyish ones. Her history is that from a sheep farm. Makes sense its from sight memory (probably not a good one as she jumps out of her skin). The fun I have is if I sense we are about to come across one, I say to her baaaaaad-news in a humour form of the sounded sheep. She seems to not get so worked up although does take huge 2 eyes on target and picked ears at rock. I think if it moved we would be home rather quickly. Over all I am interested in how well horses can see (flat, 3D,colour and how they see (memory triggers from brain or the now). 13 is not a green horse and now I question the eye brain left and right functionality. What an awesome blog post! I definitely need to work on controlling my frustration. that he feels my level of confidence all the time. I’m the one I’m talking to so that I can be there for him. He’s an overall confident guy, thankfully! What an awesome day! And I love your comment that “Self-control on a riders part is not the lack of feeling frustrated or other negative emotions…it is the ability to control one’s self when they come up.” That is so important of a distinction to make as many people think if they don’t ever feel frustrated or have negative emotions that it’s because they have so much self-control — and then when something DOES happen that causes frustration or negative emotions, those are the people who tend to react more because they haven’t developed the ability to manage those emotions. 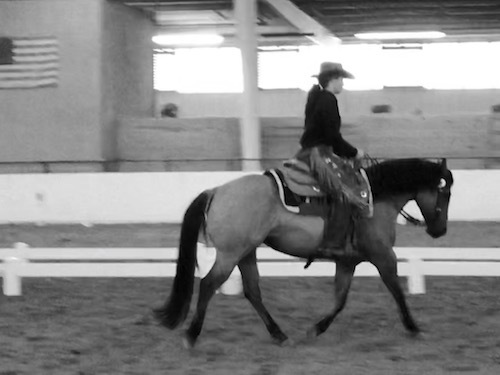 So excited that you and Willow are doing Western Dressage! I love, love buckskins. I’m glad she and you did so well at the show. I agree with the judge. They saw something special in Willow.